The Tomatina is said to have originated from a spontaneous bust-up amongst villagers in 1945. 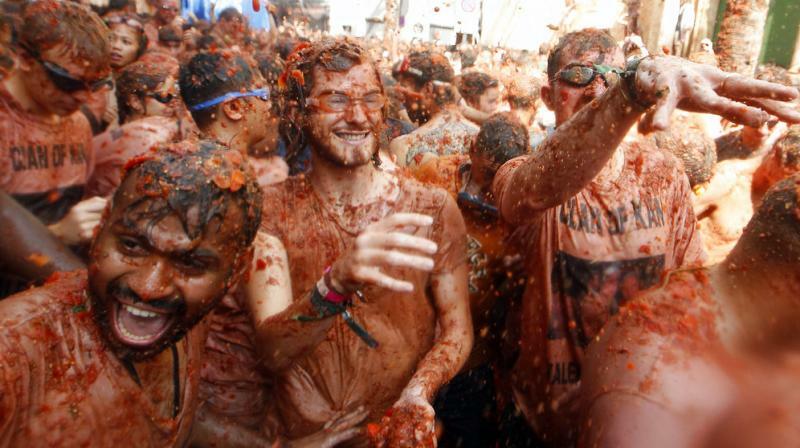 Bunol: Thousands of revellers hurled some 145 tonnes of tomatoes at each other on Wednesday, celebrating the messy annual Tomatina festival in the eastern Spanish town of Bunol. A fire cracker signal marked the start of the massive food fight at 11 am (0900 GMT) and during the next hour, six trucks loaded with over-ripe tomatoes drove through the small town’s main street providing ammunition for festival-goers. Some wore sunglasses or goggles as protection for their eyes as they covered each other in red pulp. The Tomatina is said to have originated from a spontaneous bust-up amongst villagers in 1945. It was banned for a while during the 1950s at the height of General Francisco Franco’s dictatorship, but today draws large crowds of locals as well as foreign tourists.